Mark 6:53-56 - When they had crossed over, they landed at Gennesaret and anchored there. As soon as they got out of the boat, people recognized Jesus. They ran throughout that whole region and carried the sick on mats to wherever they heard he was. And wherever he went—into villages, towns or countryside—they placed the sick in the marketplaces. They begged him to let them touch even the edge of his cloak, and all who touched it were healed. In chapter 6 Mark is dealing with the twin themes of unbelief and hardness of heart. This summary passage serves as a foil to the rejection of Jesus by the people of Nazareth (6:5-6) and the disciples' inability to grasp the significance of Jesus as revealed in previous miracles (v. 52). 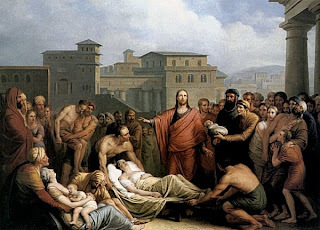 In spite of those setbacks, Jesus is widely hailed by the people of Gennesaret as a wonderworker.